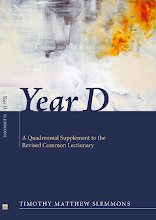 UPDATE: A discount code is available for orders placed with the publisher on bulk purchases of 10 copies or more of Year D: A Quadrennial Supplement ... If your lectionary study group, presbytery, conference, Sunday school class, or other reading group would like a discount on a large order, e-mail james (at) wipfandstock.com or tslemmons (at) dbq.edu. Have you ever wondered what texts are omitted from the Revised Common Lectionary (RCL) and why? You are not alone. Although Year D does not capture the entire remainder of the canon, it advances significantly toward that goal. This it is able to do, in part, by placing larger lections on the preachers desk, as it were, not necessarily with the intention that all of the lections will be read in worship. In short, it identifies overlooked texts and arranges for their orderly consideration and study, with the expectation that the preacher will in most cases need to make the final determination as to which specific verses shall be read and form the basis for the sermon. Year D begins, as does every church year, with the season of Advent, but in light of how little nativity material we have in the biblical canon, it is surprising how much is left out of the RCL. Most of the omissions are related to the birth of John the Baptist, so it is understandable that the focus in Years A, B, and C is on Jesus himself. If these really are "the days of Elijah," however, as one popular song has it, why not explore Luke's nativity texts that concern God's gift of a son to Zechariah and Elizabeth, the forerunner of Jesus Christ, who ministered in the spirit and power of Elijah? What other light might the Book of Malachi have to shed on this figure, or on this period of prophetic expectation? Or what might you discover in Luke's genealogy of Jesus, as distinct from Matthew's? Perhaps we might rediscover some vital connections between the New Testament and the Old or "larger" Testament (as Walter Brueggemann has called it). Another excellent place to start is with the Epistle to the Hebrews, which in Year D begins a semi-continuous cycle in Advent consisting of lections from the Epistle that did not make the RCL. In many ways the tone for the whole of Year D is appropriately set by this first reading, specifically, Hebrews 2:1-4, where we are urged to "pay greater attention to what we have heard" so that we do not "neglect so great a salvation." What better way to begin to address biblical illiteracy in the mainline! This rich and unique epistle invites your best exegetical work and your most penetrating theological questions. The main thing to bear in mind when putting this website to use in your planning is to either: (1) search the monthly archives for the resources you need, looking roughly in the month where the event in question occurs; (2) use the search box at the upper left to search the site; or (3) click on the RSS feed box in your browser address window, which will open up another search box. I have posting things since mid-2010, and have since "bumped" the posting dates to correspond with the Sundays of 2010. 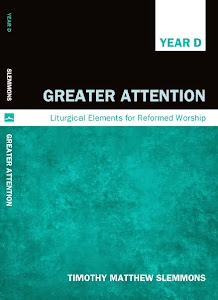 As a year's worth of basic liturgical elements will soon be up, by the grace of God, you can search by month, but don't be misled by the calendar year, as you will find many materials for the Spring of the liturgical year under March, April, May, etc., ... of 2010. For more advanced planning, or to see Year D at a glance, see the earliest postings in March: Year D - Parts I, II, and III. One further note: As time allows, I will try and post some commentary for a week's worth of texts at a time (see, e.g., the 16th Sunday of Ordinary Time), but as this is rather time consuming and extracurricular (with respect to my current teaching duties), these entries will be sporadic at best, and you will do well to make use of your own theological libraries, and not rely on this site as a "one stop shop." Hopefully, these entries will be filled out in due course, but for now, this feature of the site, and the site itself, remains a "project," but a project built in free and full view of anyone who finds it useful or simply passes by and wonders with me what new, reforming, and/or constructive thing the Lord might do with it as the church rediscovers the hidden and neglected treasures of "the strange new world of the Bible" (Barth). May the Lord bless you, dear readers and users of Year D, with all the life - temporal and eternal - that the Word and the Spirit of God alone can give to you, to your families, to your congregations, and to the communities in which you serve. 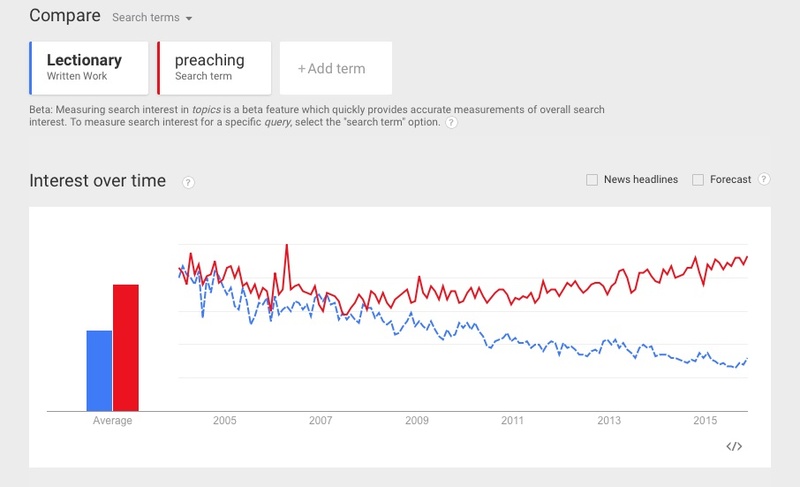 Now, on to Year D, as we "listen to what the Spirit is saying to the churches!"